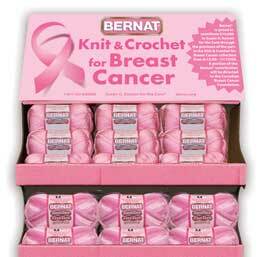 Bernet has announced a new line of yarn to support the fight against breast cancer! The line includes an assortment of pink, pink and more pink. A portion of the proceeds ($10,000) will be given to the Susan G. Komen Breast Cancer Foundation. These yarns are encouraged to be used for making chemo caps, scarves and shawls for breast cancer fighters. You can find the new yarn line in stores such as Joann, etc. I can’t wait till the next time I go yarn shopping! Need help finding a place to donate your crochet items? Visit the Crochet Spot Charity Page! This entry was posted on Tuesday, September 8th, 2009 at 12:43 PM by Rachel Choi	and is filed under News. You can follow any responses to this entry through the RSS 2.0 feed. You can leave a response, or trackback from your own site. That’s great! I think I’m going to pick up a few to make some beanies to give to my local hospital. Hi Rachel, I have been in JoAnn and looked for this yarn and I even asked the personel about it and nobody knew anything. I have tried to buy from JoAnn on the internet and they do not know. Maybe is coming later. Yup, I think it’s coming later (not sure the exact date). Bernet just announced it in their most recent newsletter to give people a heads up of whats to come. I’ve tried Joanns, Micheals, and Hobby Lobby and they don’t have them, is there anywhere online I can buy them? Thanks to Gigi, who just emailed me more info about the bernet yarns! The name of the yarns that will be included are Berella 4, boa, cotton stripe and satin. She was able to check out AcMoore and they had the stand of yarn (so hopefully they will be in other stores soon, if not already). The spools were 3.5oz and costs $3.99 each.